Is yogurt good for you? It appears that the answer is a resounding yes. Yogurt is a thick, custardy dairy product made from natural bacterial fermentation of milk. To make yogurt, active bacterial cultures are added to milk or cream. There are several different bacteria used to culture yogurt: lactobacillus acidophilus, streptococcus thermophilis and lactobacillus bulgaricus are common choices. Commercially-prepared yogurt is available pretty much anywhere you shop for groceries. You can also make yogurt at home. Another popular form of yogurt is frozen yogurt, which can be found in grocery stores and at most places that sell ice cream. With bacteria like streptococcus as a main ingredient, you might be wondering, is yogurt good for you really? These bacteria are considered beneficial bacteria that help preserve a good balance of healthy intestinal flora. Some bacteria is necessary in the human body to keep yeast at bay. As a matter of fact, yogurt is recommended after a course of antibiotics to replenish the healthy bacteria that has been killed off by the antibiotics. After taking a broad-spectrum antibiotic, often the drug has not only killed the bacteria causing the infection, but also the beneficial bacteria the body needs to function and balance out yeast. Yogurt can be very helpful in replenishing this bacteria. One of the terms that you hear bandied about in health circles these days is "probiotics". Quite simply, probiotics are living organisms that help to benefit your health. Probiotics have positive effects on digestion, intestinal health and immune function. 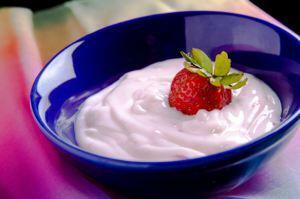 Yogurt containing "live and active cultures" are probiotic in nature. For pro-biotic benefits be sure to check the label for the words, "live and active cultures." As you can see, it definitely makes points as far as probiotics, but what about the nutritional profile of yogurt. Are there other health benefits as well? The answer to that question is an unqualified yes. Yogurt gives you a healthy dose of protein. A six ounce serving has about nine grams of protein. Yogurt confers all of the health benefits of other dairy foods, including being rich in calcium, potassium, magnesium, vitamin D and vitamins B-2 and B-12. It may prevent osteoporosis. Essential to osteoporosis prevention is calcium and vitamin D intake. These two nutrients work together and help to affect bone mass. Yogurt made with added vitamin D can help to keep the bones strong and healthy. Read labels to determine which yogurts have this essential ingredient added. It may be helpful in maintaining healthy blood pressure. There is a causal link between regular low-fat dairy intake and healthy blood pressure. Yogurt is a low-fat dairy product. It may help with conditions of the gut, including lactose intolerance, constipation, diarrhea and inflammatory bowel syndrome (IBS). This is due in large part to the healthy concentrations of probiotic bacteria. It may help prevent yeast infection. Again, the main reason behind this is that the bacteria in the yogurt promotes a healthy balance of flora. It may help control appetite. There is some evidence that low-fat dairy products - in particular yogurt - eaten as a snack can help to control hunger levels. This may be because of the level of protein in the yogurt. Protein is satiating and burns relatively slowly, so for a low caloric intake, it may help you to stay full longer. Select a low-fat yogurt with minimal sugar. If you want to avoid sugar altogether, select plain low-fat yogurt and add your own fruit. This provides not only the health benefits of the yogurt, but the nutritional profile and antioxidants of the fruit. To gain the most benefit from the yogurt, be sure to look for the words "live and active cultures" on the label. If they aren't there, find a yogurt that does have those ingredients. If you are allergic to dairy products, you should avoid yogurt, as well. It turns out that yogurt is a very healthy food, especially if you follow the guidelines above. If you're looking for a delicious snack that will confer maximum health benefits, then you can't go wrong with yogurt.